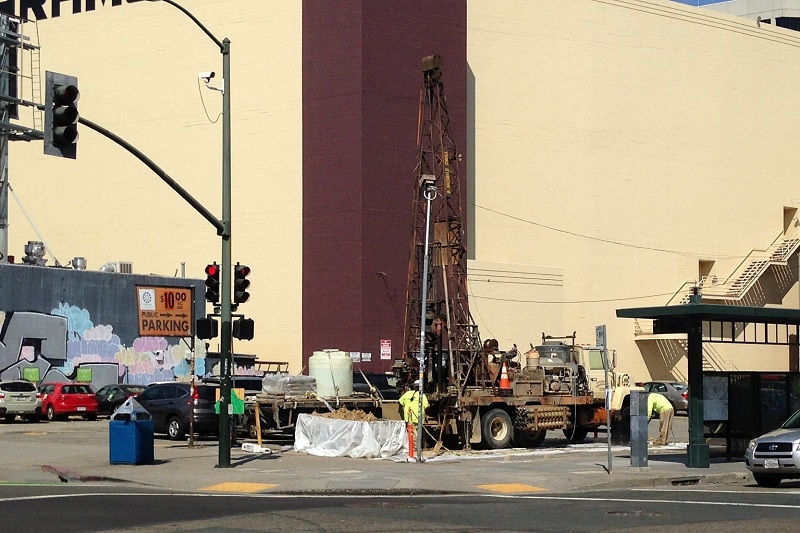 With all the construction going on around town, you’ll see lots of drill rigs taking geotechnical cores. 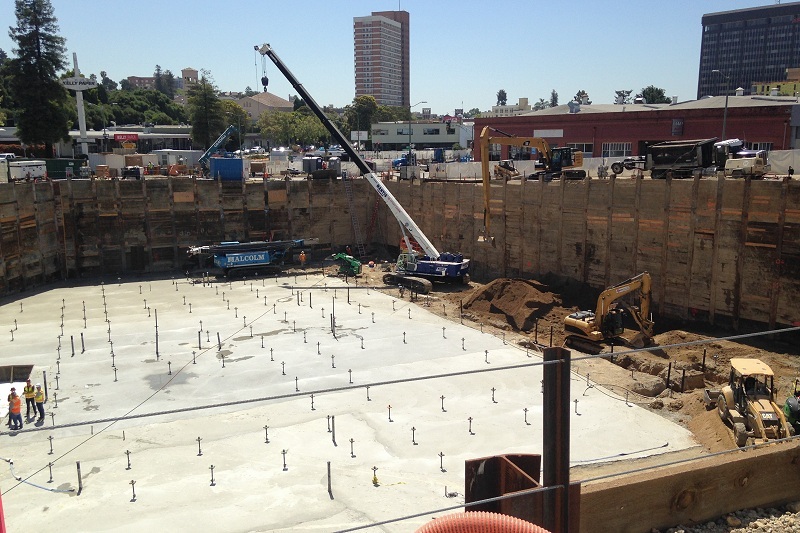 This one was at work at 2330 Webster, where the Webster Alexan development will go. 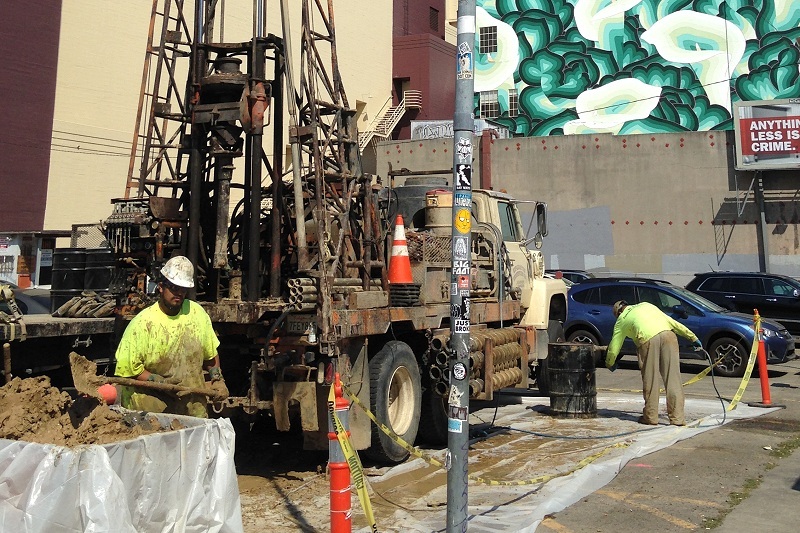 Just a few days earlier, a rig was collecting cores in the parking lot at 20th and Telegraph, slated to become one of two residential towers. Crews like this are testing the ground to firm up the construction plans. 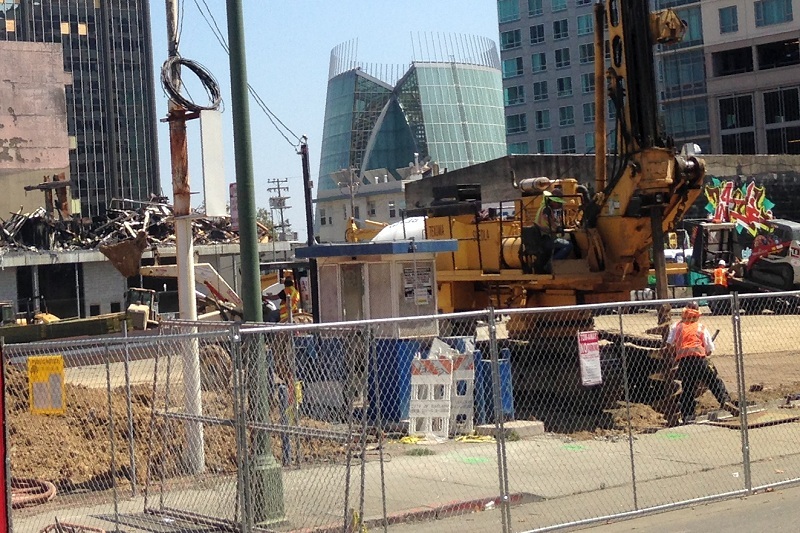 The weight of these buildings requires a foundation that won’t sink, buckle or deform under the expected loads over the building’s life, including earthquake loads. At the Telegraph site two holes were bored, at opposite ends of the lot. It takes a couple of workers to run the rig and a geologist to log the hole. They look the same — vests, boots, hardhats — except the geologist carries a clipboard and isn’t quite as muddy. The geologist on this job was a young guy, crouched in the sun and processing sediment plugs that looked like this. It’s nice, clean marine clay from the lower part of the hole. I refrained from nibbling on a piece to gauge its silt content. It was real firm, not sticky. I’d put a house on it, no problem. The geologist was poking at the plugs with a pocket tool and keeping them properly organized. He told me the hole was around 90 feet deep, with this stuff at the bottom. The top 20 feet was sand and gravel, then about 30 feet of clay, then some more sand and gravel and finally this clay. It’s a common pattern around the Bay, reflecting the changes in sea level over the last few hundred thousand years. The crew was finished in less than a day, and they tidied up nicely afterward. 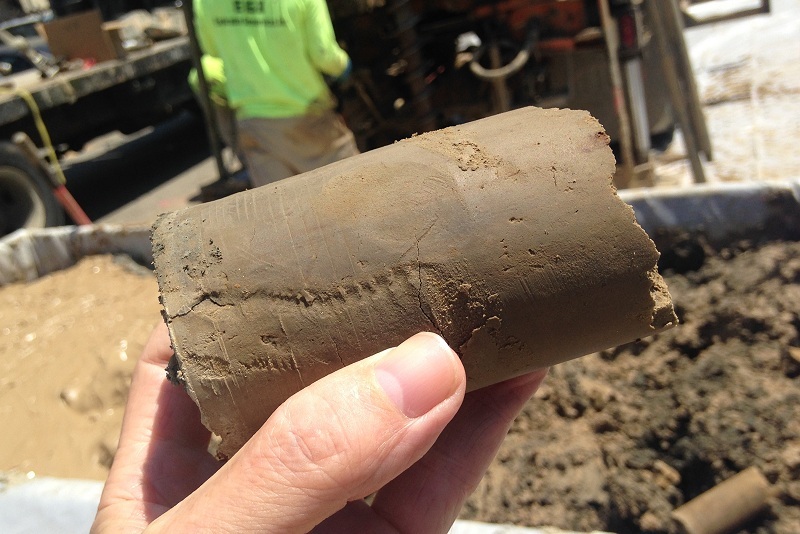 The U.S. Geological Survey’s Open-File Report 2014-1127, “Geologic Logs of Geotechnical Cores from the Subsurface Sacramento-San Joaquin Delta, California,” will give an idea of what core logging involves when it’s done right. What seems like painstaking drudgery is essential for building safely, and geologists can get called into court to vouch for the accuracy of their core logs. 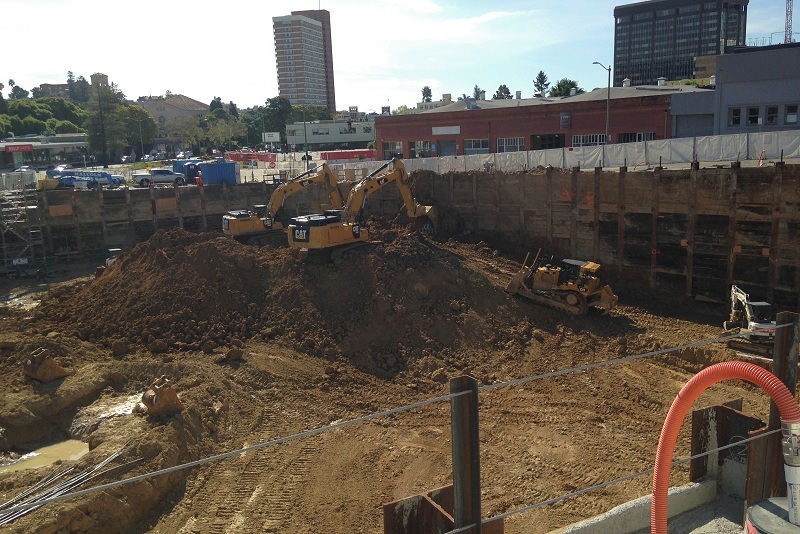 Because I walk through the area regularly, I’ve kept an envious eye on the excavation at the southeast corner of 27th Street and Broadway. Since the building slated for the site doesn’t have a name yet, I’ll call it the Biff’s site after the much-loved but long-departed Biff’s Coffee Shop that once sat there. It’s at the center of the maps below — first the Google terrain map. Then the historic map. This is from an 1888 map compiled by state surveyor Julius Henkenius, served up by the David Rumsey Map Collection. What I like about it is that it shows the creeks. The main stream is Glen Echo Creek, with the Broadway Branch joining it near the top of the map. 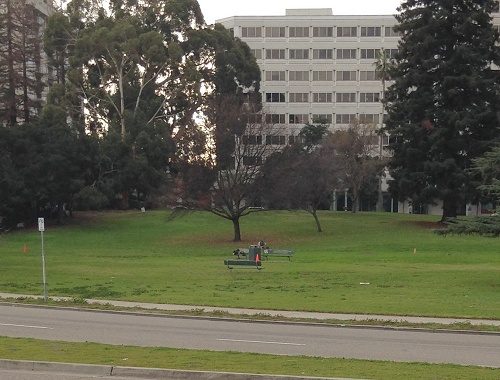 The 27th and Broadway site appears to include the southern half of the Cogswell tract, presumably the remarkable Henry Cogswell whose great monument is a highlight of Mountain View Cemetery. 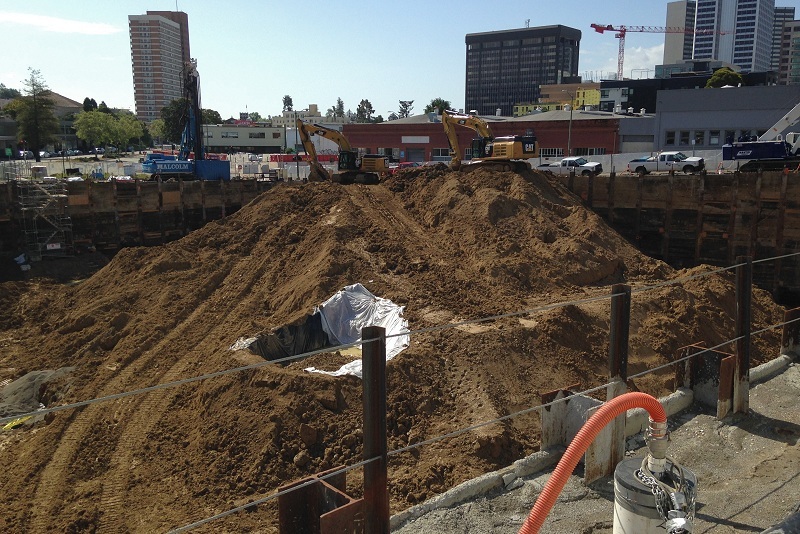 Anyway, what’s under the ground here? For that, we want the geologic map. This site is at an interesting intersection. 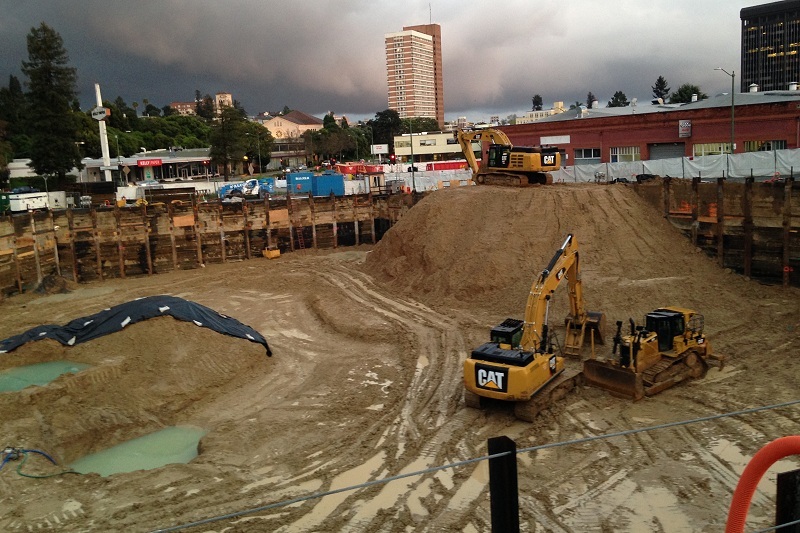 The site is flanked by two lobes of the ancient alluvial fan (Qpaf) that covers central Oakland. The one on the left is Pill Hill — which was known as Academy Hill in the 1880s and the site of Anthony Chabot’s first municipal reservoir — and the lobe on the right is Adams Point Hill. To the south, the ground is mapped as Pleistocene marine terrace deposits (Qmt), and the site itself is mapped as ordinary alluvial sediment. Knowing all that, it would have been fun to poke around as the excavation proceeded from 24 March . . .
. . . to 1 April . . .
. . . to 19 April . . .
. . . to 7 May, when the digging was complete and the foundation prep was under way. The chances were that no mammoth skulls or other cool megafossils were present, but you never know. It all looked like well-sorted fine sand from my distant viewpoint, what you’d expect. If this had been a Caltrans project, they might have retained a paleo firm to watch the digging and grab any fossils the dozers turned up. But as of last week the exposure is all over. Most of the time, science is just an indulgence. 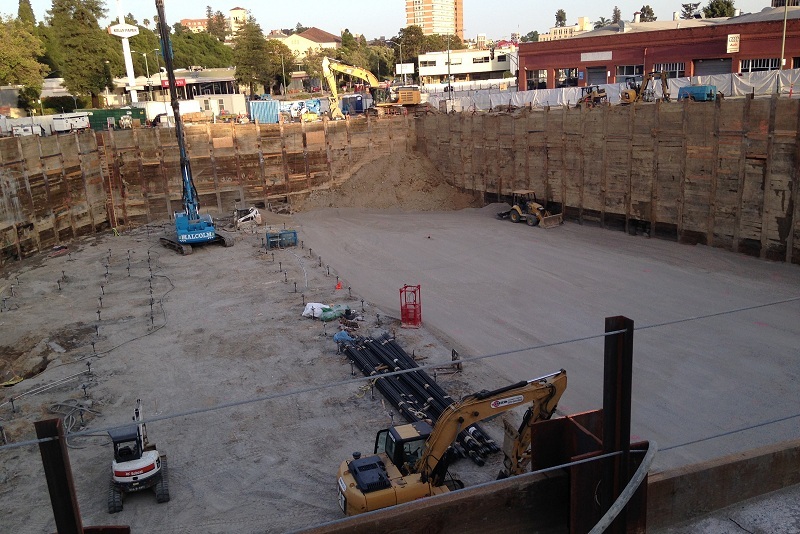 But as Oakland enters a downtown building boom, it would be nice if the experts got a chance to document and sample some of these big holes. They’ve been building some new parking in Lakeside Park, near the boathouse, and the work opened up the subsoil to view. You’re looking at a hard, pure marine clay from a time when the sea rode high, late in the Pleistocene Epoch. 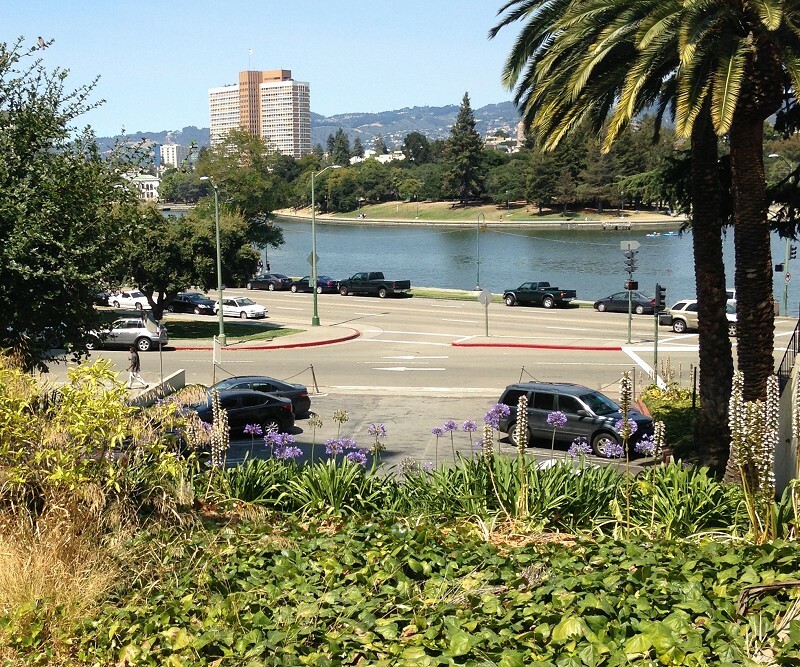 Lakeside Park sits on the flat surface of a terrace a little over 20 feet elevation. It matches other surfaces in the Uptown/Valdez area and in old Clinton, all of which are assigned an age of around 125,000 years. The scenario is this: As the great continental glaciers melted well beyond their extent today, the sea brimmed over and rose about 6 meters above its present level. The advancing waves carved their way into the Oakland landscape, creating a wave-cut platform, and then all was peaceful for a few thousand years. That’s when the nice clay topping was laid down. Only the finest sediment could get this far away from the new shore because all the stream valleys were drowned. Later the Earth’s orbital cycles proceeded, the climate cooled, the glaciers grew back and the sea retreated. On this side of the bay, far from the Pacific surf, the process was gentle enough to leave behind much of the evidence. Elsewhere in the East Bay, the clay beds from this time were thick enough to support a brick industry. 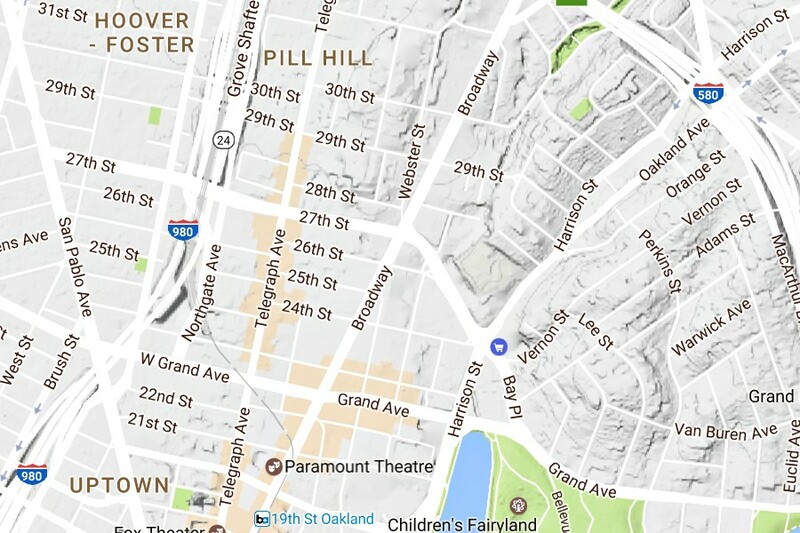 Downtown Oakland sits on an unusual bit of geology — a large dune field mapped as the Merritt Sand. San Francisco is famous for its sand dunes, of course, and Points Reyes and Año Nuevo have some too, but the dune fields of Oakland and Alameda are the only ones within the bay. 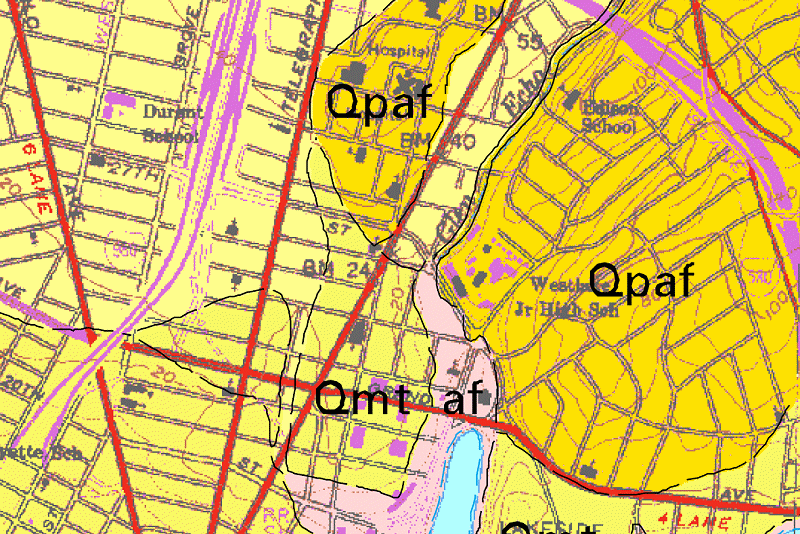 Here they are, labeled “Qds” on USGS Map OF-00-444, which shows the young (Quaternary) deposits of the Bay area. They’re just like the dunes in San Francisco. 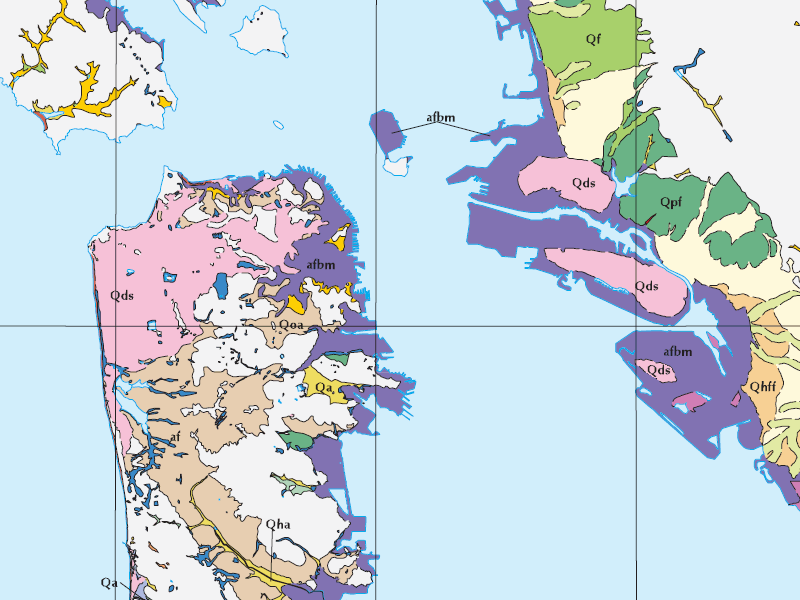 They formed during the ice ages, when the shoreline was out near the Farallon Islands, the Bay was totally dry and the Sierra was full of permanent glaciers (on not quite the same schedule as the great continental ice caps). The rivers carried huge amounts of fresh-ground rock dust from the glaciers to the Bay and beyond, and the Pacific beaches of the time must have been formidable. Think of the brisk summer days we have when the sea wind is being sucked into the Central Valley, and now multiply that. Those winds blew all that sand here. Our dunes may sit higher than the buried dunes of the Delta because the conditions that built them were more stable here. There was always a wind gap at the Golden Gate and always lots of sand available on the other side. 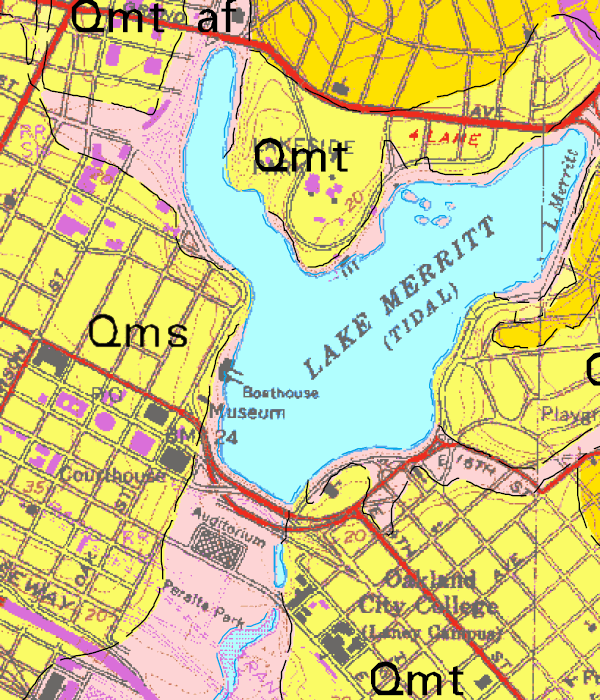 In detail, the Merritt Sand (Qms) reaches the edge of Lake Merritt. 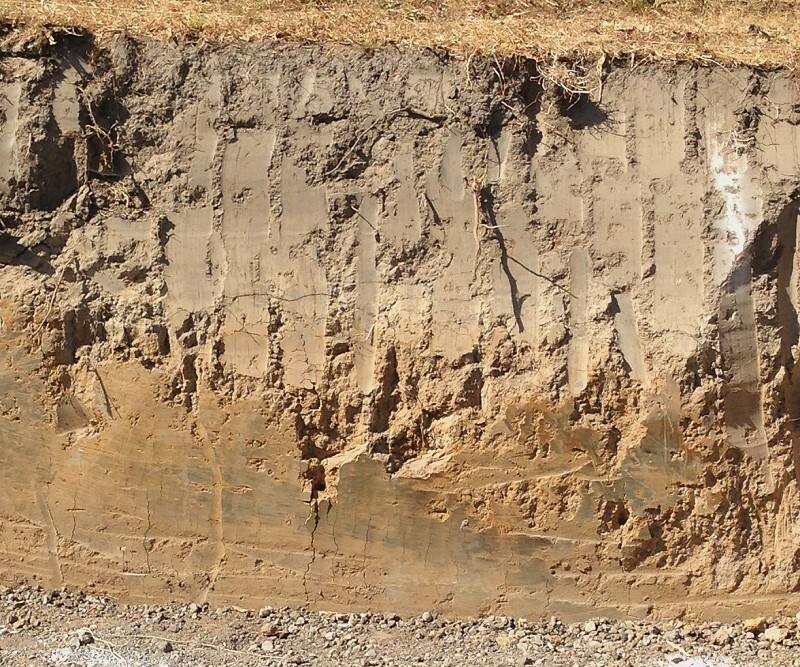 It differs from the marine terrace deposits (Qmt) that I’ve described before. It consists of very fine sand, with no clay. It’s also higher and less flat. Apparently the original, undisturbed surface featured yardangs — elongated ridges of sand running in the direction of the wind — whereas the dunes of Alameda were the more typical arc shapes known as barchans. All of that is obliterated today. 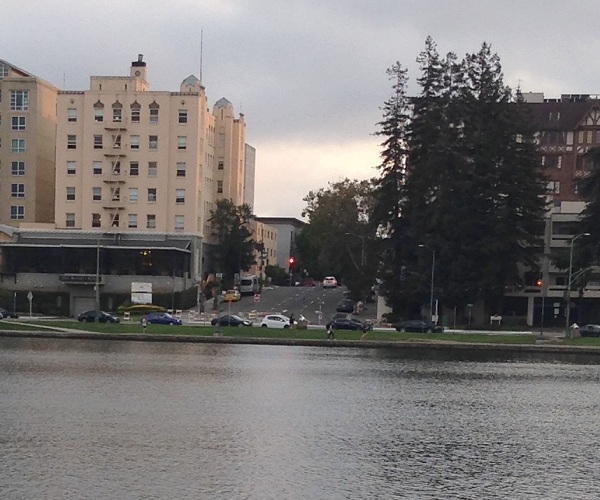 You can see the edge of the Merritt Sand platform from across the lake where the streets rise abruptly away from the shore. Snow Park is probably the least disturbed exposure. Another exposure stands out between Jackson and Madison streets, although it probably has also been excavated. 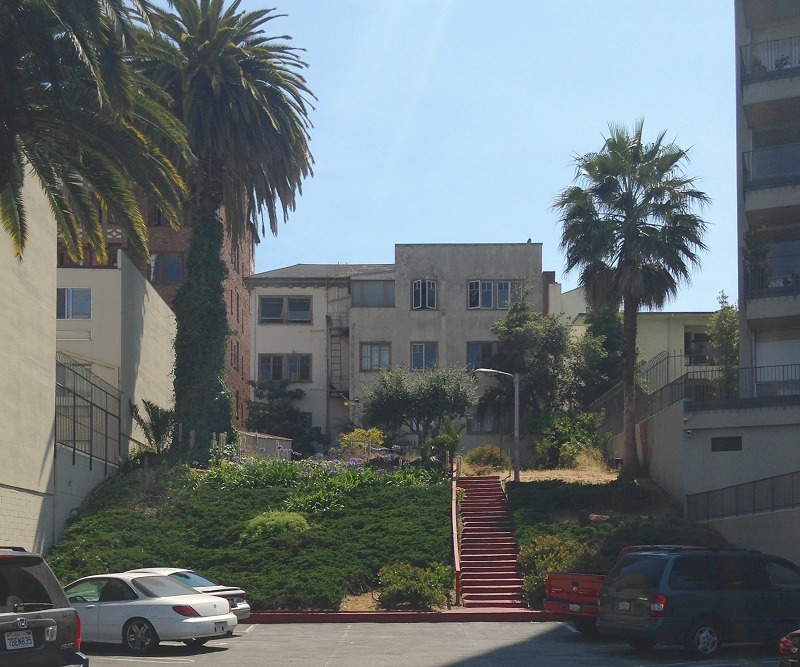 It’s the back yard of an apartment building at 160 17th Street. The view is nice from there. 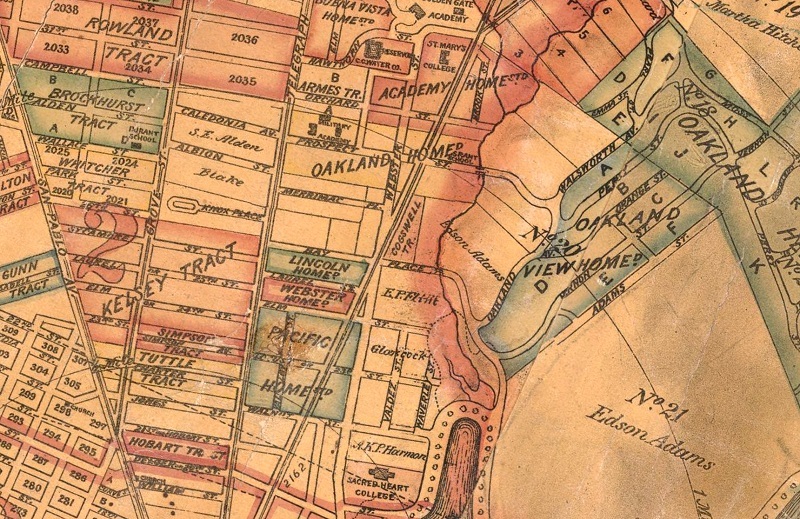 That same agreeable elevation attracted Oakland’s early elite, who put up a row of mansions overlooking the lake. Of those great homes, only the Camron-Stanford House survives.